I know that I spend an inordinate amount of time analyzing those of us who spend or have spent a hefty portion of our lives working in kitchens. Maybe I tend to over-think what it takes to be a kitchen warrior, but after all it is what I know. To me, and many thousands of others, the life of a professional cook is sometimes glamorous, mostly incredibly difficult, sometimes monotonous, occasionally painful, but always gratifying at many levels. With this many complex outcomes, it only makes sense that so many writers are investing time on building stories about the life of a cook. Writers who try to understand this “cook’s life” from the outside looking in, are generally unable to really paint a picture that captures the essence of that person behind the apron. Those who, on the other hand, tell the story from the inside out, like to focus on the sinister side, the hard nose stories of subterranean, less than savory individuals who are always on the verge of questionable lifestyles, because it sells books. In reality, the truth is typically somewhere in-between these portrayals. What is unquestionable is that those who either chose to work in kitchens or those who find that the kitchen chose them are interesting characters. If you look back, you may very well discover that many cooks were not the life of the party when they were younger. Chances are, they weren’t the type to hang out with the popular crowd, and probably didn’t participate in many team sports. Even today, when taken out of their kitchen element, cooks are not likely the people who stimulate conversations. But….in the kitchen, and after hours with their kitchen clan, these individuals rise to the occasion cracking jokes, telling stories, expressing opinions, and taking on a role that those outside of the kitchen who thought they knew them, would look on in complete disbelief. Cooks relate to cooks. The kitchen is where their personalities stand tall. Kitchen life tends to set the tone for the rest of a cook’s life. Kitchens demand fast pace, intense work, in-your-face interactions, an ability to demonstrate stamina and even resilience to pain. This cannot simply be turned off when the shift ends. Those few hours of camaraderie at a local bar will be just as intense as a busy service off the line. Too much alcohol, too much laughter, macho displays, exaggerated stories, and worse, will carry those cooks past their decompression time from too much adrenaline on the line. Solid cooks become obsessed with order and organization. They may not have been the most together person in their pre-kitchen life, but once they walk through those restaurant doors their lives are dictated by mise en place and dependence on the cadence of orders given by the chef or sous chef. This order is what winds up their clocks and sets them on a path of work that yields desired results. When this order and brigade system of direction is not present, a cook’s life falls into chaos (just look at a typical cooks apartment to see a perfect example). The badge of honor in a kitchen is a monster burn, cut, ample stitches, black and blue marks, blisters, or even self-inflicted pain from tattoos. Nine consecutive 12- hour days is something to be proud of, not admonished. No pain, no gain is the theme song in most kitchens. “Why am I here”, is a question that most people ask at some point in their lives, but cooks tend to reflect on this, maybe more than most. The beauty of the kitchen is that there is purpose to the profession, sometimes purpose that takes many years to realize, yet purpose that can be viewed as significant. Cooks provide sustenance, reward, creative opportunities, environments and vehicles for people to communicate over, and a sense of family both in the kitchen and in the dining room. Every day in the kitchen is a competition. Cooks may not have ever been interested in joining a sport team, or trying out for anything that resembled a desire to win or lose, but in the kitchen – competition is alive and well. How quickly can you get your mise en place together, how many pick-ups can you handle on your station, did we beat last Saturdays cover count, how many days can we work without a reported injury, did we beat our budget last month, and the list goes on and on. Cook’s love to find some win to have bragging rights about. 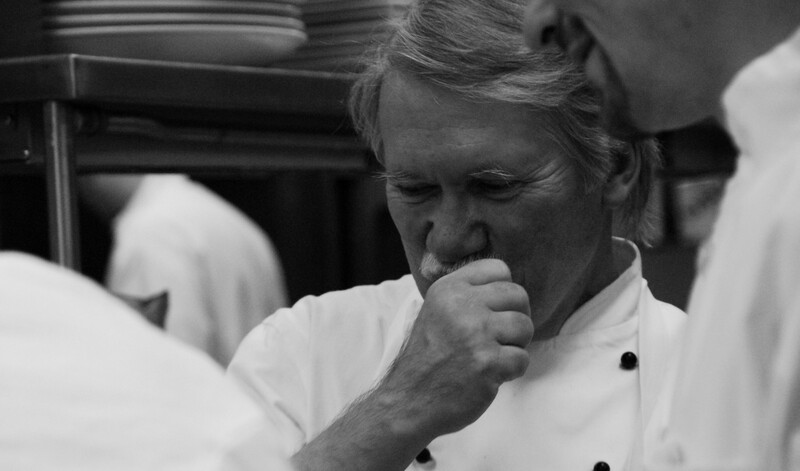 Every day in the kitchen is an opportunity to mentally record and later embellish upon a story. Just visit the local bar where cooks gather after work to hear the tall tales. The unfortunate thing (or maybe it is fortunate) about working in kitchens is that your life is the polar opposite from everyone else. Most people work during the day – you work at night. Most people have weekends and holidays off – these are the busiest days for cooks. Most people are able to find time for family and friends – cooks struggle with this. So, if there is a love interest for a cook, it is usually with another cook or server. Even Danny Meyer, the owner and consummate restaurateur of enormously successful operations based out of NYC states that he met his wife and mother of four children while they worked together in a restaurant. It is difficult for other relationships to start due to the cook’s alternate lifestyle, and because you work together, in-house relationships rarely last. This of course creates unusual stress in the restaurant, thus the reason why most chefs discourage restaurant relationships, but typically turn their back on those that do develop. What is important to many cooks is today. When you come to work in the kitchen it is impossible to be effective at your job if your mind strays from the immediate. I have known many cooks whose outside lives are in shambles because they can’t possibly think beyond today. Taxes go unpaid, cars fall in disrepair, important birthdays and family events are forgotten, and appointments are rarely met. Cooks are passionate people who tend to drift from cause to cause simply because they don’t have the time or attention span to stay with whatever they believe in at the moment. Whether they have a current cause or not, every cook is ready to defend a position on something, but know that too much attention to a cause will take them away from the immediacy of the job “living in the moment”. To a person I can safely say that every cook is seriously proud of what they do and as such very fragile when it comes to critique. I have seen six foot; physically fit, highly intelligent line cooks lower their heads in disappointment when a customer is unhappy with what they cooked. A chef’s derogatory comment can bring them almost to tears in the same fashion as a football coach can bring a 300-pound defensive player to his knees in shame. We are proud people and sensitive workers on a mission to make people happy. A person may start his or her career in the kitchen with some poorly aligned prejudices about gender, size, age, race, religion, or political beliefs, but quickly learn that the kitchen family is all equal. Those who refuse to accept this become the demise of a team or, in most cases; he or she will wind up moving on to haunt some other business. After a short stint in kitchens, cooks become aware that they are different than the larger population. Forty-hour workweeks, eight-hour days, breaks and “normal” behavior just don’t make sense when compared to the life of the kitchen. It is ironic how when asked, most who escape from the kitchen tend to reflect back on what a wonderful time they had working the hours, dealing with the heat, accepting the stress, burning their arms, and wondering how they will ever get through another service. The good times may not be the norm, but they are good enough to flood every kitchen expatriates memory. Of course, when these memory lapses occur, any current member of a kitchen team is more than willing to remind the kitchen deserter about the reality of life behind the line. In any case, it is easy to see how there is plenty of material for hundreds of new books that reflect the stories of the kitchen and the life of a cook. If you can’t wait for the book idea to find a publisher, simply stop into your local late night bar and buy a cook a drink. The stories are there. 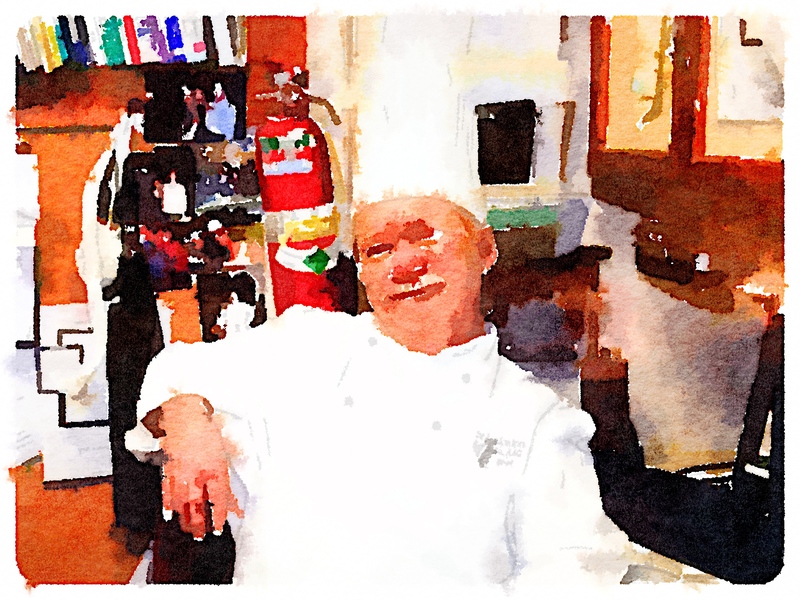 ← CHEF – DOES YOUR RESTAURANT TELL A STORY?